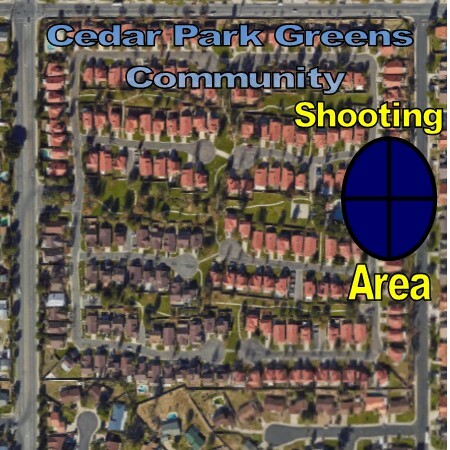 At 4:39 pm on Sunday over 20 shots rang out in the Cedar Park Greens community in the Flores Park Area. Residents who were trying to report the shots fired incident were given a high call volume message and 911 calls would not connect. The shooting was on the east side of the multi housing community. This is the same community where the two dodger fans who beat up Giants fan Brian Stow lived. Cedar Park Greens is the nasty community everyone just pretends doesn’t exist until something bad happens said Eric a local resident that walks Etiwanda daily. “It was pretty scary happened right behind my house. We were outside enjoying this beautiful weather, I thought it was fireworks at first, until something whizzed by my friends head. Lord help us all” said Sandra. Last reports were that there were no victims located as yet. Multiple shooters and at least three vehicles. Helicopter found couple possible shooters. Police found empty shell casings in the street. Police were checking all hospitals as parties involved left the scene. Reports are at least three shooters according to witness statements. So far we know that multiple “victims” were shot at and fled the scene. At least one party called police to identify that they fled the scene after being shot at and police were in route to interview them. Three separate series of gun shots rang out through the community. With the large problem with illegal fireworks in Rialto some people were unsure at first about what they were hearing. As of 9pm no reports of injuries or arrests have been made.